PATA’s Asia Pacific Visitor Forecasts 2017-2021 Full Report for 39 destinations within Asia Pacific reveals powerful economic figures on the fastest-growing tourism region in the world – now available at the PATA Store. China and the Russian Federation will be among the key source markets to watch over the next five years. This is one of the key takeaways from the just released ‘Asia Pacific Visitor Forecasts 2017-2021 Full Report’. Following on from the earlier Executive Summary Report, this latest release delves deeper into origin-destination pairs for 39 Asia Pacific destinations as well as providing tourism receipts, income and price elasticities (where data permit). Through 2017 the major international visitor-generating markets will be driven by China in Asia, and the USA and Mexico in the Americas. Greater China – comprising China, Chinese Taipei, Hong Kong SAR and Macao SAR – is expected to generate more than 261 million international arrivals to the 39 Asia Pacific destinations covered in this report, an annual growth rate of 7.9 percent year-on-year and an incremental increase in an absolute volume of over 19 million arrivals. 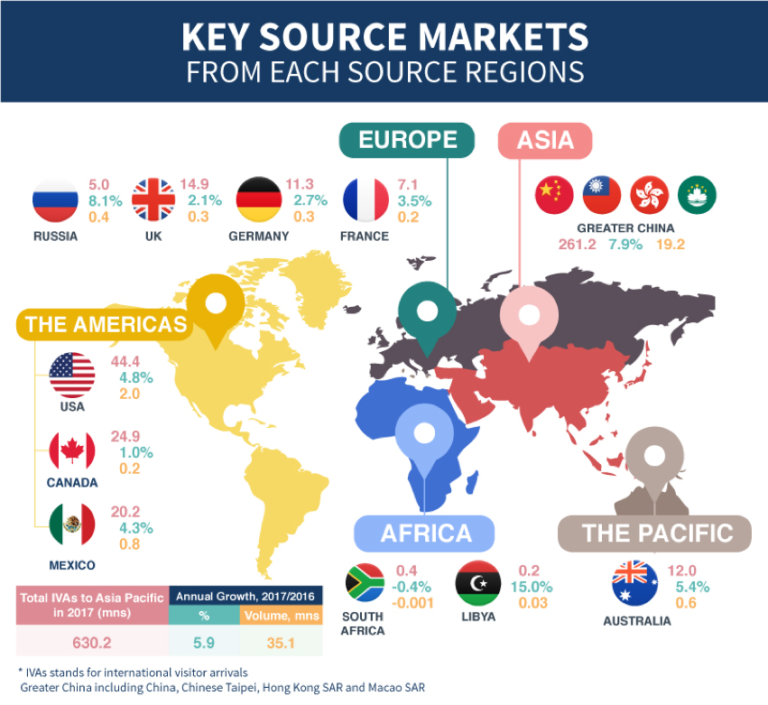 Arrivals from the Americas are expected to expand at an Average Annual Growth Rate (AAGR) of 2.3 percent per annum, between 2016 and 2021, while Europe will grow by 3.1 percent per annum. While these rates are lower than the overall AAGR of five percent, they never the less contribute to a substantial volume of arrivals into Asia Pacific, generating over 116 million and 76 million arrivals respectively in 2021. These lower than average AAGRs, however, mean that, in relative terms, the share of foreign arrivals from the Americas and Europe will decline from 17.5 percent to 15.0 percent in the case of the Americas and from 11 percent to 10.2 percent in the case of Europe.